It's time for another Simplicity challenge! This week's challenge is all about using a single image, a border and a little bling on a single layer card. Tougher than it sounds. Since I need a few more Valentine cards, I decided to follow this theme. The end result is a kraft card base with my image and border stamped in Memento Lady Bug Red. 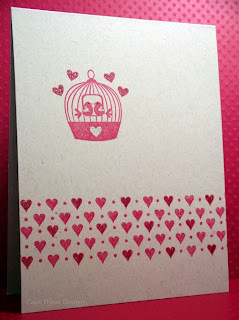 The heart border is from Impress Rubber Stamps and the birdcage is by Craft Smart....$1.00 stamps from Mike's. 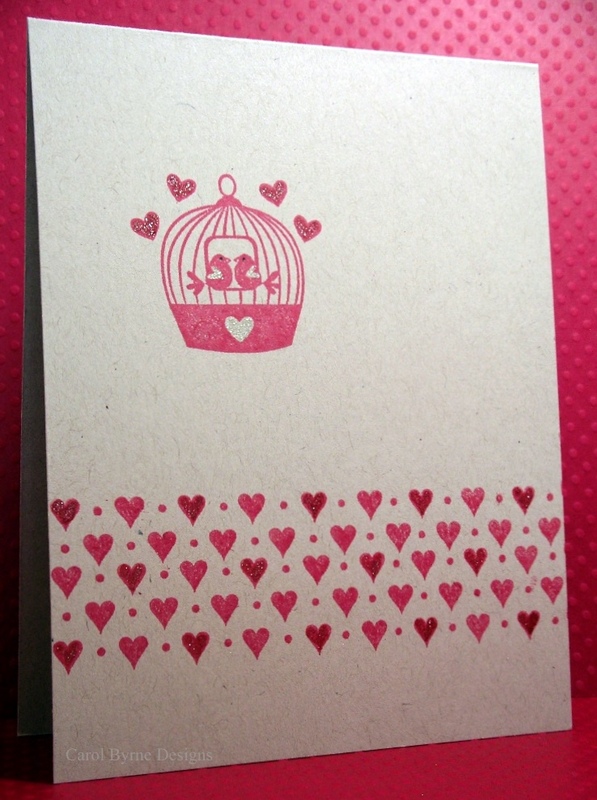 I added a little bit of red Spica glitter pen to some of the red hearts and my clear Sakura glitter pen to the open heart of the birdcage and bird wings. Loved this card. Thanks for letting me come to Florida and play with you. Also thanks for the help with copics. I think this is gorgeous - love the heart border!! And the subtle sparkle on the hearts. It's lovely! Oh, so cute! I have this little $1 stamp also. I really like how you used it. Enjoy seeing your posts. Thank you friends and family of Carol who have birthdays. Cute! I know what you mean about a sentiment... and I caved and put a little extra border on mine (all in the name of balance). :) Good job on the challenge.